The cold war between Ethiopia and Eritrea once seemed irresolvable. An uneasy stalemate had endured since 2000, when a UN-brokered peace agreement ended two years of trench warfare that claimed about 80,000 lives and displaced more than half a million. The deal was swiftly ignored by Ethiopia, which refused to cede the border town of Badme and other disputed territories. In subsequent years both sides massed thousands of troops on the frontier, while arming each other’s rebel groups. Occasionally tensions would boil over. Eritrea’s alleged support for Islamist rebels in neighbouring Somalia led to a UN arms embargo in 2009, prompted in large part by Ethiopia’s desire to push its northern rival, which had seceded in 1993, into diplomatic isolation. It was one of Africa’s most intractable conflicts. So why, on July 8th, did the two sides make peace? The appointment in April of a new Ethiopian prime minister, 41-year-old Abiy Ahmed (pictured above, right), was vital. On taking office he called for peace, as did his two predecessors. But in early June he went further, by offering to implement the UN peace agreement, including its controversial ruling on the location of the border, without preconditions. The political and generational shift within the ruling Ethiopian People’s Revolutionary Democratic Front (EPRDF) heralded by his rise had made such fresh thinking possible. Mr Abiy’s Oromo faction in the ethnic coalition lacks the baggage of the Tigrayan wing (the TPLF), which dominated Ethiopia’s government for the past quarter-century and has especially close (and bitter) ties with Eritrea’s ruling party, a former rebel movement once known as the Eritrean People’s Liberation Front (EPLF). The two groups spent much of the 1970s and 1980s fighting alongside each other against Ethiopia’s then Marxist dictatorship, but relations were rarely amicable. “The Eritrean-Ethiopian war of 1998-2000 was in effect a conflict between the EPLF and TPLF over ideology and hegemony,” explains Kjetil Tronvoll of Bjorknes University College. 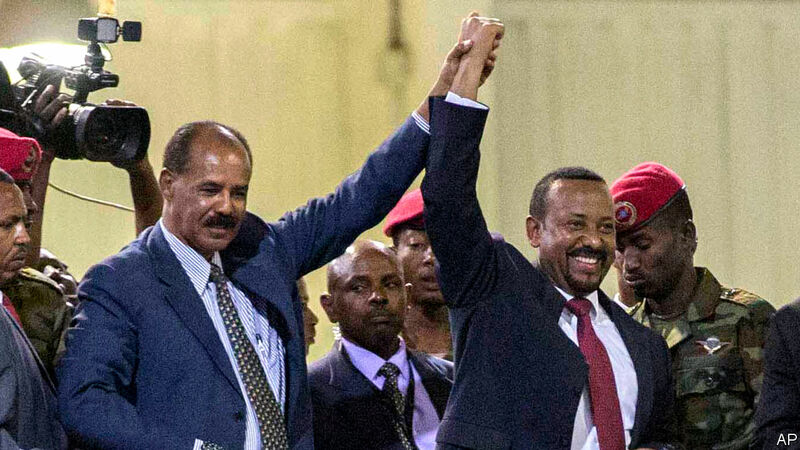 As Mr Abiy sidelined the TPLF, so grew the chance of peace with Isaias Afwerki (pictured above, left), Eritrea’s first, and to date only, president. Smart diplomacy helped, too. In April Donald Yamamoto, America’s most senior diplomat in Africa, visited Asmara, Eritrea’s capital—the first such envoy in over a decade—before travelling on to Addis Ababa, the Ethiopian capital. It was a sign of America’s interest in rekindling its own ties with Eritrea. Mr Yamamoto is said to have hosted meetings between senior officials in Washington and to have set up a diplomatic back-channel. Meanwhile Mr Abiy enlisted Eritrea’s patrons in the Gulf, Saudi Arabia and the United Arab Emirates (UAE), as brokers. His first overseas visit as prime minister was to Saudi Arabia, where he asked Muhammad bin Salman, the crown prince, to persuade Mr Isaias to respond to his entreaties. Later the crown prince’s counterpart in UAE, Muhammad bin Zayed, hosted the Eritrean president, reportedly promising the country cash and investment in exchange for peace. But the roots of the thaw go deeper still. Eritrea is wealthier and less isolated than it once was. The UAE has been leasing the port of Assab since 2015 and built a base nearby to assist in its military campaign across the Red Sea in Yemen. Eritrea has also benefited from renewed engagement with the European Union, which is anxious to stem the flow of migrants from the Horn of Africa. Across the border the EPRDF had been crippled by nearly three years of anti-government protests. Policymakers in Addis Ababa worried that the “no war, no peace” status quo with their neighbours to the north was unsustainable, and that Eritrea was gaining more influence in the wider region. A particularly nasty skirmish between Ethiopian and Eritrean troops in June 2016 revealed the Ethiopians’ skittishness. The following April the then Ethiopian prime minister, Hailemariam Desalegn, announced that his government was working on a new, possibly more muscular Eritrean policy, though the details were never revealed. Mr Abiy has had success with a more amiable approach.